It’s time to make that new quilt! 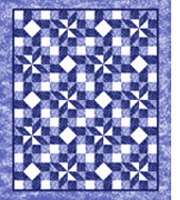 —this is a regular quilt constructed with multiple blocks to make a Queen-Size Quilt. Each block is over 20 inches square so you’re still working with large pieces, so the quilt will go together quickly.